We can all think of instances in our lives when we have felt either confident or under-confident in regard to a particular challenge that lies ahead of us. It might be an upcoming business meeting, perhaps a key presentation that needs to be made but whatever it is, the chances are we will approach it with a level of confidence and, be this high or low, it may well have a bearing on the results we achieve. 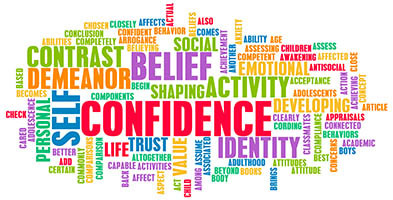 A common objective of virtually every learner we work with is, ‘to have more confidence’, so what is confidence and how do we develop it? Well, it’s an interesting quality that’s hard to define; we see others, for example sportsmen and women all around us who seem to excel at what they do and for whom getting results at their chosen pursuit appears the simplest and most straightforward thing in the world - they seem do it effortlessly and with the utmost ease. They just seem to have bags of confidence! What we can say is that confidence can be developed through a 4-step process or, a virtuous cycle. Critically, we can only gain access to this positive cycle in terms of how we think and what we do. We cannot achieve any sort of a result without taking action and we cannot make ourselves feel one way or another - these are outputs. How we think has everything to do with determining our attitude ahead of any particular challenge so, be our attitude +ve or -ve, we are totally in control of it. When our attitude is -ve it can be hard to do anything, even getting started can be a challenge but, when it is positive we take action and we get the opportunity to consider the results. Now, as important as taking action is, it is how we view the result that really determines whether this cycle will end up being virtuous or vicious. Our challenge is to see the positives before we see the negatives but this doesn’t mean we don’t seek improvements in the result, it simply means we reinforce the positives first and foremost and it is this that makes us more likely to repeat the cycle and take action next time, all the time developing our confidence bit by bit. We are all our own greatest critics so where we beat ourselves up about the result and fail to see the positives, we risk not taking action next time and it is this more than anything that limits our ability to build confidence and the cycle becomes a vicious one. Additionally, when we develop a positive attitude towards the challenges we have - in business and in our personal lives - we have a very real chance of achieving what we want and this includes the things we may have previously thought were beyond us.